Aiming at creating new markets! We’re mainly putting the emphasis on business promotion for new value creation in South East Asia, China and Japan. With a population of 240 million, Indonesia is the largest Islamic country in Asia. In the society Islamic law is strict, but the younger age group have the foundation of accepting new value. Joining the trend toward it, the spread of manufacturing technique of Japan and Japanese brands is spread through overseas joint management. Environmental problem which attracts attention from the world. To contribute to the solution, Japan is challenging the improvement of the water infrastructure of Southeast Asia and developing countries with the environmental technology which Japan is proud of in the world. Manufacturing technique of Japan is developed overseas. The spread of manufacturing technique of Japan and Japanese brands are performed through overseas joint management. 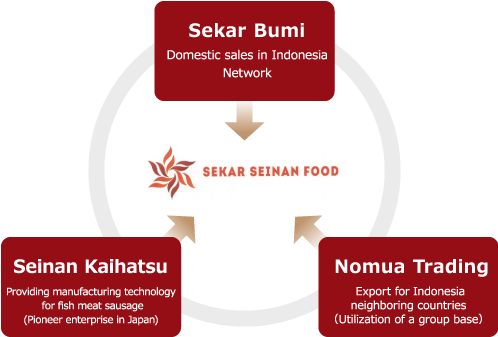 Seinan-kaihatsu holds manufacturing know-hows of business-use food, such as frozen pie, beef patty. The prime business of SEKAR BUMI is manufacturing and selling of frozen processed goods focusing on marine products. Our company is making an export sale of goods using the Indonesian affiliated company as an export base, and utilizes the base within ASEAN area.